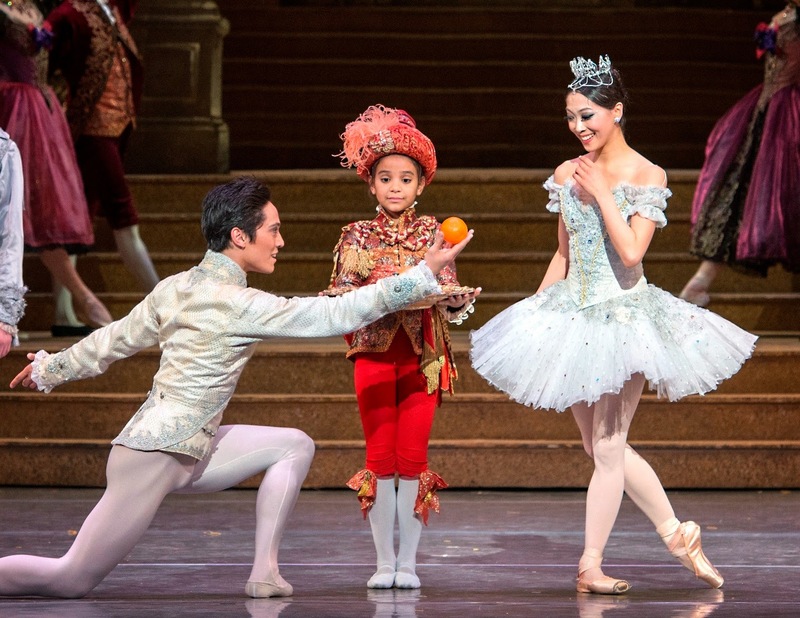 Jeffrey Cirio, Misa Kuranaga, and one of three oranges in Cinderella. Photos: Gene Schiavone. Boston Ballet has by now carved out a reputation in almost every choreographic niche. They have long specialized in both the classic story ballets and the modernism of Balanchine, and more recently have been lauded for stunning pirouettes on the cutting edge of postmodern dance. But they've rarely essayed Sir Frederick Ashton, the brilliant choreographer who single-handedly created a British brand of ballet, and whose style is immediately recognizable, if a bit hard to define. The Ashton "look" seems to draw its power from the dancer's core rather than legs, and features a secure yet gently flowing port de bras. Footwork is likewise fluid, or even fluttering, with soft landings, clean arabesques, and leaps that are almost lopes. Hence the company's premiere of Cinderella, Ashton's 1948 rendering of Prokofiev's score (which plays through this weekend only), arrived trailing an unspoken question: could Boston Ballet master yet another style? 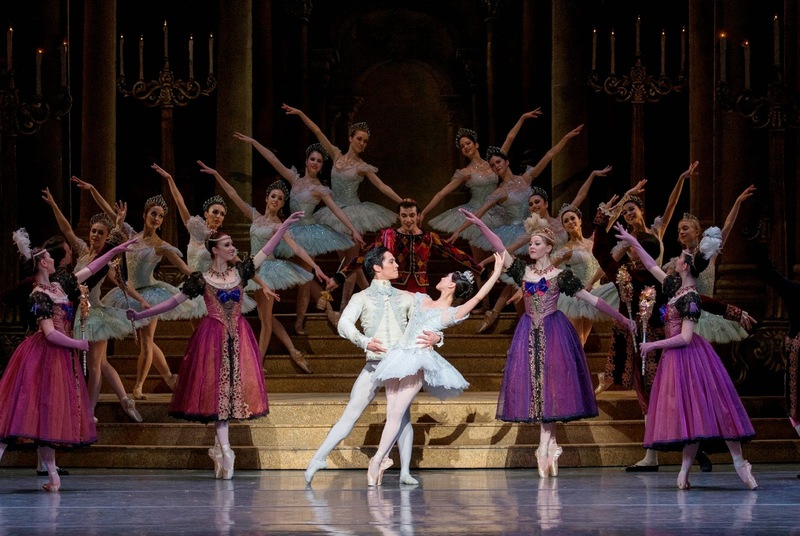 Well, the short answer is - yes, or at least its stars certainly can: Misa Kuranaga and Jeffrey Cirio (above), as the title heroine and her Prince Charming, looked as if they'd been dancing Ashton all their lives. And elsewhere a similar graceful élan largely held sway: the female corps was its usual crystalline self, and if the men were less than clean in their double tours, they made up for it by springing through their leaps like so many gazelles. The ballet itself is a luminous masterpiece - even if it's a little long for the kids. Although he had been making dances for years, Cinderella was Ashton's first evening-length effort, and that shows a bit here and there: the first act has a few loungers (the solos by various fairies get a bit repetitive), and as Ashton himself danced one of Cinderella's Stepsisters "en travesti" (as drag was called then), he sometimes tipped the balance of the dance a little too far in his own direction. But this is hard to fault when the roles are played by the likes of Boyko Dossev and Yury Yanowsky, both wrapped in more ruffles than you could shake a slipper at (see masthead). Dossev has long been known as the Ballet's most inspired clown, and his take on Ashton's role - all clueless stumbles and nervous uncertainty - was quite endearing in its dim innocence. The surprise was that Yanowsky more than held his own, gag by gag and step by step; his sister was the crass, grasping one who never knew when to take "no" for an answer (and usually paid the price for her mistake in a pratfall). To be honest, the roles have a rueful subtext today - they recall the closet in a curious way (Ashton of course was gay); but they're also a splendid, even sweet, circus act, and that's how the kids will see them. A grand tableau at the climactic ball. And there was more virtuosity elsewhere - in the daring leaps of Avetik Karapetyan's Jester, and the aquiline attack of Anaïs Chalendard as the Summer Fairy, which contrasted neatly with the icy poise of Dusty Button's Winter Fairy. Meanwhile Isaac Akiba made much of a running schtick as Napoleon (somehow he and Wellington - a forbearing Bo Busy - were both invited to the same party! ), and Petra Conti brought a serene control, but perhaps not much warmth, to Cinderella's Fairy Godmother. But in the end the ballet boiled down to Misa and Jeffrey. There are wonderful moments throughout (the clock striking twelve is indeed striking, as is Ashton's evocation of Cinderella's slippers by having her step down a staircase en pointe), but the choreography reaches its peak in a pas de deux between the prince and princess-to-be which is all but breath-taking in its musicality and grace. Here Kuranaga was winsome but resolute in pursuit of her dreams, while Cirio was practically romantic purity incarnate - and both were technically superb. And as we expect by now from the Ballet, the physical production was also ravishing. Down in the pit, conductor Jonathan McPhee brought a pointed attack to the poignant lilt of the Prokofiev score (which includes an amusing quote from the composer's own Love for Three Oranges), while onstage, a series of opulent sets and costumes (from the Joffrey Ballet) unfurled before our eyes. And at the finale, all the dazzle turned to literal shimmer, as Cinderella and her Prince vanished into a magical cascade of glitter. It was a haunting final touch to another memorable production.